Several ‘bags of air’ from Kobe Bryant’s final game hit eBay on Saturday, with bidding starting at the low price of $1. The price quickly got up over $15,000. 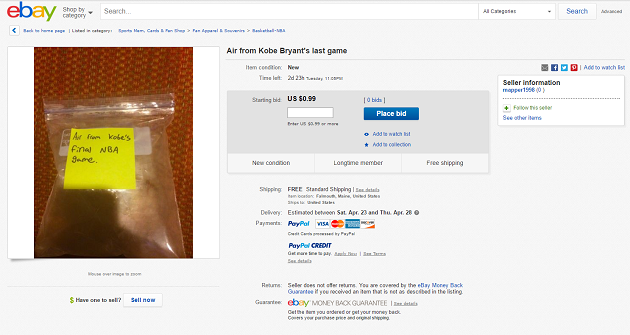 Several ‘bags of air’ from Kobe Bryant’s final game hit eBay on Saturday, with bidding starting at the low price of $1. There’s a 99.9% chance this isn’t the real air from Kobe’s final game, but who cares? It’ll cost you one measly dollar to bid on. Maybe five in the end. • Did Jay Z take Kobe Bryant's final game ball home? Or, what's that? $800? Yeah, over 60 bids have been placed on the bag of air pictured above. Amazing! You’ll never be able to open it. UPDATE (Sunday, 12:25 a.m. ET): Things have taken a strange turn. The bag of air is up to $15,000. What is going on here? The seller could be the one placing all the bids, but he should know eBay takes a percentage of what you end up selling your item for. So, if it's him, he's losing money on this. 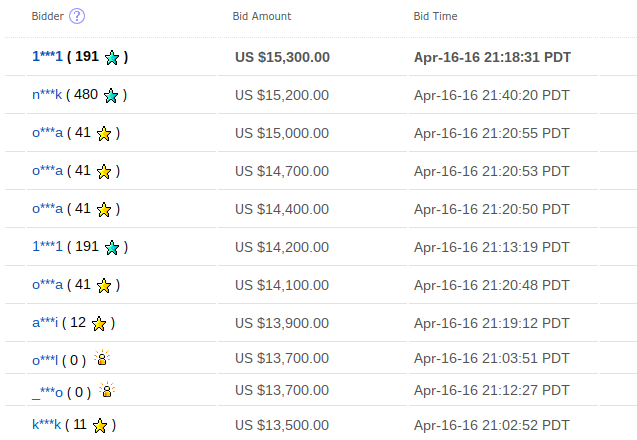 By the looks of it, the current top bidders in that screengrab are reputable buyers and are totally set on buying this item. One has a 480 buyer rating from eBay. If the bidders think they won't have to pay, there's no way to prove this isn't actual air from Kobe's last game. Someone is totally losing money here in some capacity, over an item that is probably fake. UPDATE (8:35 a.m. ET): The listing has been taken down. What a ride.